2007 January — Are You Watching This?! A good blog gimmick is an important crutch to keep good blogmentum, so here’s the first one: YouTube Tuesday. Every Tuesday I’ll post a clip from the treasure trove that is YouTube. This week? A recap of the final, frantic minutes of the ESPY winning, 1994 football game between Plano East and John Tyler high schools. I done wet my britches. Whew, time to get my game face on—this two week layoff thing is tough. Enough partying in South Beach. After getting into the routine of a game every weekend, it’s hard to deal with the two weeks off. I know you haven’t heard from me in over a week, but it’s just a few more days until Super Sunday Monday. That’s right. Public launch is on Monday. Why am I wasting my time on another marginally witty blog post you ask? Well jackass, because while I’ve been slacking on the blog duties we’ve rolled out a bunch of new features. Televised Game Alerts – Did you catch the Texas/OSU game? I didn’t. I’m serious. So here comes Alerts to save me from further embarrassment. 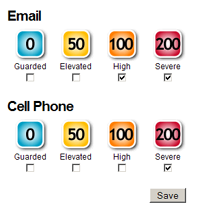 Just select the level of alerts you want and if you want them sent via email or cell phone. Or master your domain even more by choosing “The LaDainian”: High alerts sent via email and those show-stopping Severe alerts sent to both your email account and your cell phone. Bleachers – Let’s be honest. You’re going to watch a lot more games from a bar or your couch than in person this year. Just because you’ll miss out on those small seats and sticky floors, doesn’t mean you should deprive yourself of the satisfaction of screaming at that idiot fan three rows up. Each game now has its own set of Bleachers. You can head over there to keep track of the score, see who is voting for the game, and of course to post “I knew it all along!” after your team pulls off the upset. User Profiles – User Profiles have gotten a facelift and new fields have been added to let you share more about the sports, teams and players that you love and love to hate. Also, you can now post “Shout”s on your friends’ pages, a great way to let them know their Alma Mater is gonna tank this weekend. Hey folks, katieb just called to tell me that ESPN Classic is replaying Tuesday night’s Texas vs. OSU classic today at 4p Central. If you missed it the first time, get to a sports bar now. 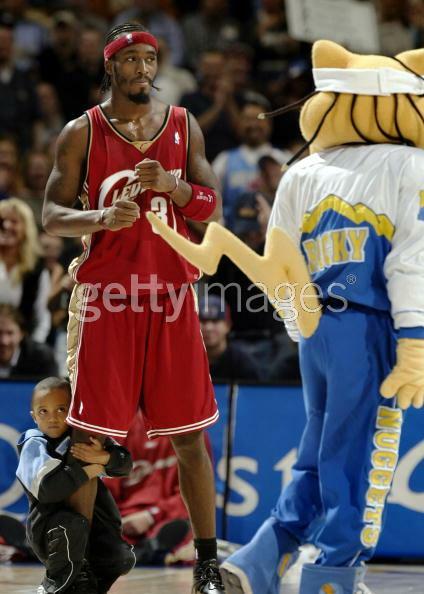 The Cavs/Nuggets game will be the headline after tonight’s UNC/Clemson tussle, and while I was searching for a good image I found this one. It’s not exactly headline image material, but it’s too good not to share. Official caption below. The City of Austin is shut down today. Part because of MLK, Jr. Day, part because once the temperature drops below 40 everything pretty much falls apart. This, after last Monday when downtown was shut down as 63 dead birds were found around the Capitol. Next Monday? Mark calls for BBQ chicken to seep up through cracks in the sidewalk all around the UT campus, prompting DHS to raise the threat level to red pepper. Book it. Devil Poultry aside, it’s a perfect day to be rockin’ the sweatpants and laying out on the couch. And what do I find as I’m flipping through the channels? One of my childhood favorites, Rocky IV. And what better way to spend this day of reflection than with this beautifully brutal movie about peace and building bridges? Okay, that might be a bit of a stretch, but man is it a quality movie. The exaggerated Cold War stereotypes, the poor man’s Gorbachev lookalike, a Flavor Flav ex- sighting, and possibly the highest musical montage count to movie length ratio ever. But there’s just something eerily similar about watching your favorite team play and watching Rocky movies—that lingering feeling that if you don’t stop whatever you’re doing to watch, Sly just might lose this time. People have been asking about whether or not they should be passing the site along to friends, so hopefully this post will clear that up. The core engine has been “alive” for a couple months now analyzing games, but there are features on the site that are still in the works. I’ve been sharing the site with friends because even in it’s “under construction” state I think it’s really a useful tool, but I won’t be shouting from a mountain-top about the site until all the planned features are finished. I expect the omnipresent “Beta” label will be taken off by the end of the month. haven’t i seen this national championship game before? but with willis mcgayhee (phonetic spelling) and that handsome young maurice clarett? At this point we can only hope this game (ignoring that McGahee played for Miami and not Florida) is half as good as the 2002 BCS Championship. I’ll be honest, the Boise State game was too good not to be the end of the college football season for me. I’ve already shut it down folks—this game just wasn’t grabbing me. And now, at halftime, with OSU’s 10 point a game defense on pace to give up a 60 spot, and Florida’s 3 for 12 kicker booting ’em from everywhere, I have a feeling the second half is gonna be a snoozer. You know you’re good when your name becomes an adjective 120 games into your career. The Stars and Oilers played an unbelievable game last night. The quick recap will tell you the Stars came back from a 3 goal deficit and won the game in a shootout, but the video will show you the last three goals were awesome (good stuff starts around 2:45), each one more exciting than the last, with the middle one an Ovechkin-like work of art. It has taken a good amount of will power not to join the masses and pile on Nick Saban and I’m quite proud of my restraint. So instead of piling on, I’ll just pass along Dan Le BAMatard‘s quality attempt at ripping Saban a new one. You are currently browsing the Are You Watching This?! blog archives for January, 2007.